Home > Honey & Skin Care > Bee So Soft Skin Creme, 0.25 Oz. Net Wt. Bee So Soft Skin Creme, 0.25 Oz. Net Wt. 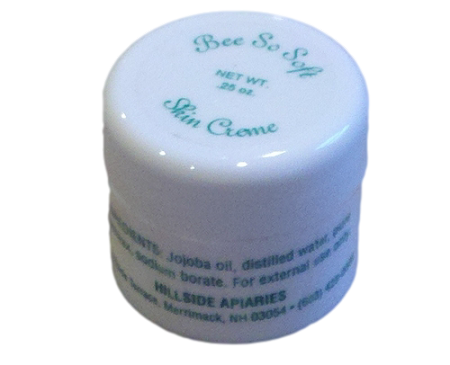 Bee So Soft Skin Creme soothes and moisturizes dry skin. Fragrance free, made with Jojoba oil and beeswax in at our facility in Merrimack, NH. We use it ourselves to help heal dry cracked hands. This 0.25 oz net weight jar is great for a stocking stuffer or to keep in your travel bag. We also have 2oz & 4 oz sizes available. 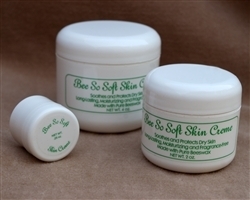 Bee So Soft Skin Creme, 2 Oz. Net Wt. Bee So Soft Skin Creme, 4 Oz. Net Wt.